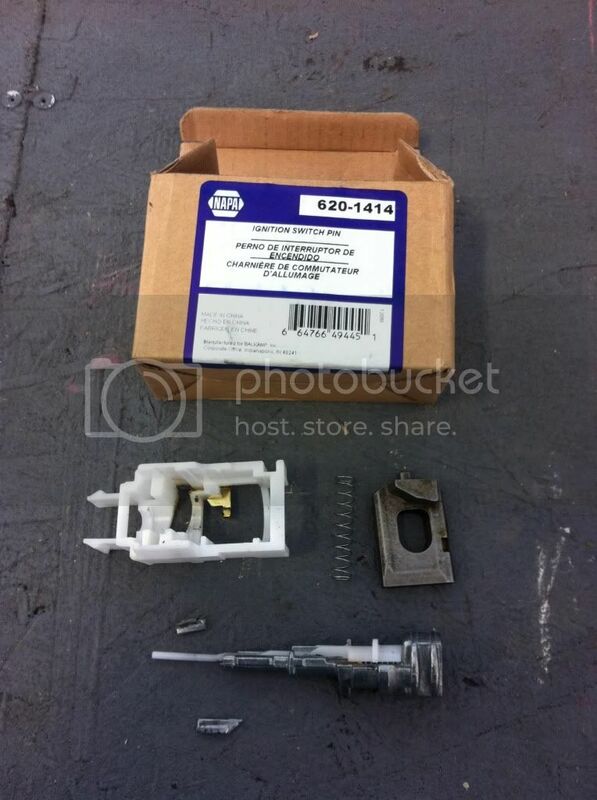 JeepForum.com > Models > Jeep Wrangler Forums > TJ Wrangler Technical Forum > Ignition Switch Pin Actuator repair. Front Axle: HP Dana 30 with RCV shafts. Rear Axle: Dana 44 with Ox locker and Superior shafts. Suspension: Johnny joints, 4-link rear. Recovery: Super winch 8500 with Amsteel Synthetic line. Armor: Savvy sliders, full corners, GTS, and Under Armor. Rokmen LoPro rear bumper, SWAG front Bumper. Future Mods: Axles, front stretch, Real cage. Ignition Switch Pin Actuator repair. When I searched I found tons of people with the same problem. I wanted to post the video Dorman made for the fix. The nut gobblers at the dealer will say you need to replace the whole steering column. Lucky for us Dorman did a little research and helped us out. I started the Jeep up heading to work, and thought the key turned funny. After the other crew left at shift change I went to move the Jeep since my station doesn't have enough parking spots when both crews are there. I turned the key and nothing happend. The rotation was off as well. T-10 Security bit (center hole). When I pulled it apart I found one of the stupidest designs ever. Broken part and Box (number) for replacment from NAPA. In a jam you could start your rig with a flat head screw driver once the above part is out. Promo video from Dorman with step by step instructions. I hope that helps the next poor sucker that gets stuck someplace. How much was it at NAPA? I got one off a Cherokee for $5. $30. Having an XJ around to rob parts from would have been nice. Accessories: JKS 1.25" BL + 1" MML, DieHard Platinum, ARB HD Wire Loom, Cibie E-Code + Narva 100/55W. Future Mods: Totally Budget Dependant. Thanks Bender, bookmarked for "when you need it you can't find it" reasons. Rokmen TT, Rokmen control arms, Novak NV241 cable shifter, JKS 1.25" BL + 1" MML. Anybody can take advice if it doesn't interfere with their plan. In case something happens to your computer or you are away from it if you need to replace the part, Rockauto have that video linked from the part detail for the pin. So I just went to the dealership to buy an ignition switch and the guy told me I actually need the actuator. My symptoms are no turn signals, radio, wipers, etc. Did anyone else have these symptoms? If when you turn the key does everything else work especially does the starter engages when all the way to the start position? If yes, then you don’t need an actuator pin. You are right, you need the switch. You can get one at a parts store instead of the dealer if you want. They like to sell you on the actuator pin because as stated above & unless things have changed recently the actuator pin is not sold at the dealer as a separate part, they only sell it as part of the complete steering column. I’ve seen it posted that that column is like $700. I’m guessing that the column also includes the ignition switch. If so & they sell you the $700 column (including the part you actually need) & you or they install it your wipers, signals, & radio will work & problem solved! You would never know all you needed was a $30 part! When you take the switch out you will have the pin out so give it a good look. They are known to crack or break & usually that symptom is you can’t get the starter to engage. You may decide to replace it as a preventive measure. If when you turn the key does everything else work especially does the starter engages when all the way to the start position? There have been a few times lately when it didn't start, but I assumed that was another issue.? I may just pick up the actuator and the switch at Carquest tomorrow so that I have both of them when I take it apart to investigate. Thanks for the reply. From everything I have read it does seem like the switch and not the actuator, though. Yes, the 3 things you mention are the 3 things that work both in the on & acc. position so the use a separate set of contacts inside the switch & seem to have gone bad. Sometimes they might work in acc. but not in the on position. I have to give that dealer credit for not selling the high price column unnecessarily. I'm not sure if I have an issue with my actuator pin or not. When I turn the key, I do hear a click that comes from the fuse panel behind the glove box, which I think is the starter relay. Since I hear this click (it only clicks once each time I turn the key), can the actuator pin be an issue for me? Its not the starter relay. The starter relay is in the PDC in front of the battery. The clicking you hear, is it when you turn the key on but not to the start position? thanks for the response. I hear a single click that comes from the glove box area. I hear the click when I turn the key all the way to the start position. OK then the actuator pin is probably good or you wouldn't get anything in the start position. No profile filled out so I don't know enough to advise further. yr, trans??? ?